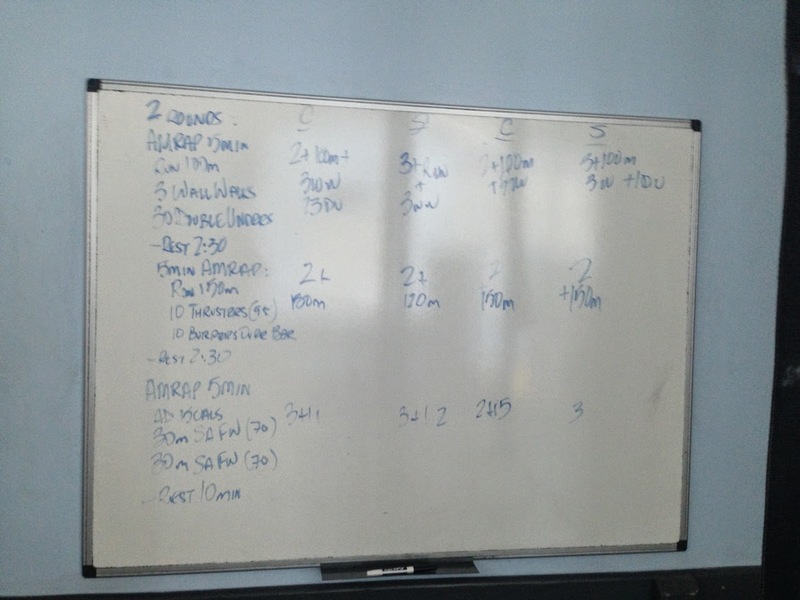 Notes: Warmed up for 10min Z1 mixed and then did about 15minutes of mobility. Chris trained with me in this workout and I enjoyed it. I am a big believer in going at "your" 85% but I think when training alone you are tricked into believing that some things might be more difficult than with others. It's not the push to go harder, it's the peace of mind that someone else is going fast, I can go fast. Wall walks felt awesome (best they ever felt). Double unders got better from set to set. The thruster/burpee sucked...bad. Just tried to keep everything under control during this portion and not spill over. The power output isn't there yet, but it was good to test the waters. Airdyne felt good (performed on new airdyne). Farmers walks weren't too bad. Overall I was happy with how things felt today, as I improved from the first set to the second set.